PTS PMAG™ (High Capacity Version) particularly designed for PTS PDR, PTS Masada 5.56 style and Tokyo Marui style M4/ M16 AEG. The new PMAG™ High Capacity Version is a 350-round compatible magazine. It features reinforced polymer construction. The PTS PMAG™ specifically expertizes in providing user with practical efficiency. In order to fulfill users’ satisfaction, PTS PMAG™ (High –Cap) engages a realistic experience in its precise dimension and high capacity design that is compatible with Maglink. PTS PMAG Gen 2 M2 High Capacity 350 Rounds distinguishes itself with a simplified feature set, but maintains an outstanding manufacturing and material quality. 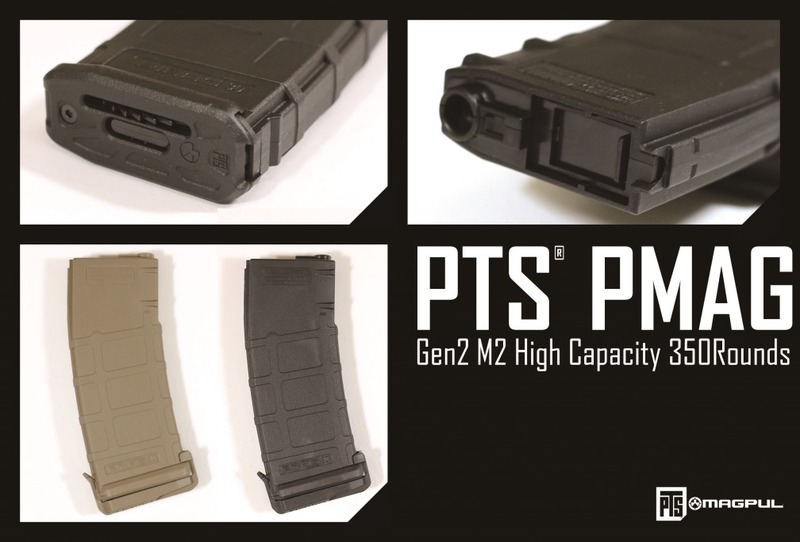 PTS is pleased to announce that PTS PMAG Gen 2 M2 High Capacity is now available. – Textured gripping surface and flared floor-plate for positive magazine handling and easy disassembly. Warning: This product is for airsoft, training and stimulation only. Please be aware that this product is not compatible with real firearms. Users should be alert that airsoft products are potentially dangerous which can cause serious injury and even death. If user misused this product, PTS will not take any responsibility accordingly.